Posted on April 12, 2017 at 7:21 am. Canada’s Elliot Smith and Australia’a Dan Laidlaw face off in Pokerstar Championship Main Event. A Canadian poker player has taken out the main prize in the PokerStars Championship Macau. The global tournament, which has also been hosted in Panama and the Bahamas, ran from March 30 up until April 9 at Macau’s City of Dreams complex. Canada’s poker pro, Elliot Smith, won the coveted event and pocketed HK$3,130,000. The 29-year old faced off against six players on the final table – this number narrowed down from a total of 536 international players. Smith managed the lead but it wasn’t an easy feat with Chinese poker pro, Terry Tang challenging him. The two negotiated a deal to split the remaining prize money equally, apart from $300,000 HKD which was set aside for the ultimate champion. Instead of finishing up quickly the pair played more than 260 hands over 10 and a half hours in a heads up battle – which is the longest a tournament has run in PokerStars history. The final hand kicked off at 1:50 am local time, where Smith won with a nut flush and Tang flopped with a set of sixes. Once the Canadian finally won the HK$40,000 buy-in event, it was revealed his total winnings over his career surpassed $CAD2 million. “I feel great about some of the spots I passed up,” Smith said. “Hats off to my opponent, who played fantastic,” he added. The final day also saw poker pros including the UK’s Aymon Hata, Canada’s Avraham Oziel, Taiwan’s Pete Chen and Australia’s Dan Laidlaw. Chen, who was 2014’s Asia Player of the Year, was the first to go, taking $HK705,000 with him. He got a 10 on the flop but was defeated by a Jack on the river. Hata came in fifth place, winning $HK950,000, which is his biggest live win after Smith made his own two pairs on the turn. Oziel, who qualified by winning a Spin & Go satellite package, came fourth scoring $HK1.28 million. He managed to get in preflop with pocket aces but lost with a seven on the flop. Laidlaw, who sits in 48th place on Australia’s all-time money list, came in third pocketing HK$1,724,000. His biggest and best win was at the 2013 Sydney Poker Championships where he won $AUD165,000. He also came close to making the finals table for the Aussie Millions Main Event that same year. He came 12th and pocketed $AUD95,000. 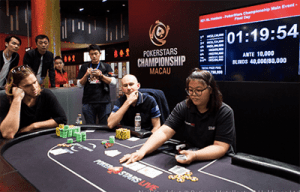 Laidlaw not only did well on day one of the PokerStars Championship Macau – scoring the second-biggest stack – but he looked like he was going to beat Smith. That was until he bricked the turn and river as the Canadian marched on.